And The Award For The Best Travel Photo Of 2008 Goes To . . .
Every year National Geographic’s Traveler holds a contest for the best amateur travel photo; 2008’s winner being a candid shot from within the Prado Museum in Madrid, a photo that earned this lucky photographer a 15-day voyage to Antarctica. To see all of this year’s winners click here. My favorite’s the third runner-up, a magical photo of a Buddhist Monastery deep in the hills of Bhutan. It’s always the third runner-up that’s getting shafted isn’t it? Their prize was an hour-long ferry ride along the coast of New Jersey during the month of February. 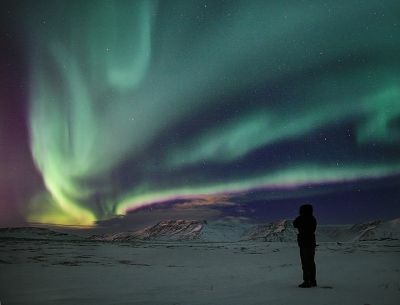 And if you were wondering, the above photo was taken by one of the winners, an Icelandic photographer named Örvar Thorgeirsson whose mind-boggling photos of Icelandic Aurora can be found here.